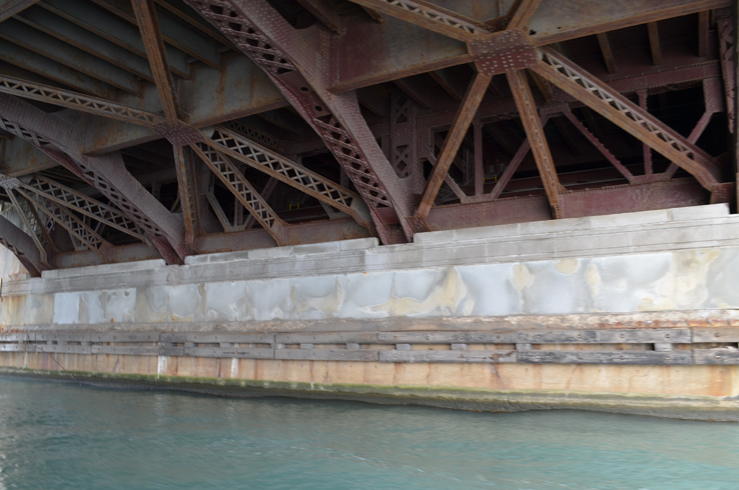 Many people love to hear about the story of the man living in the Lake Shore Drive Bridge. I tell this story in my book Chicago River Bridges and there is also a great interview by Ira Glass of Richard Dorsay at the beginning of a This American Life podcast segment entitled The Bridge. Click the link to listen from May 7, 2010. 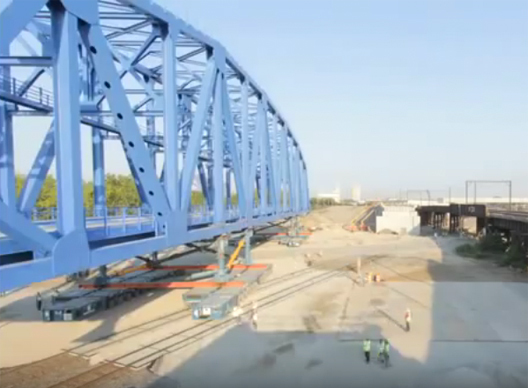 Link to News from the Chicago Department of Transportation (CDOT) for the latest on Chicago road and bridge projects including bridge lift schedules and current and impending street closings and road work. Offers professional detail-oriented photo-documentation, information, and advocacy for all types of historic bridges except covered bridges. 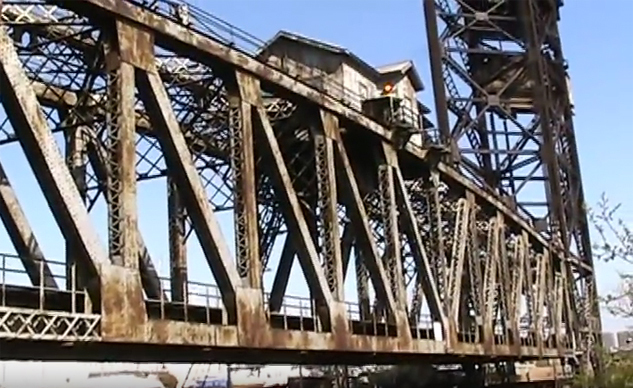 HistoricBridges.org believes that changing public funding to focus on the maintenance of existing bridges, whether historic or not, would better solve infrastructure problems in North America. HistoricBridges.org is led by Nathan Holth (Author, Webmaster, and Photographer), Rick McOmber (Photographer and Content Advisor), and Luke Gordon (Photographer). The purpose of this site, then, is to assemble a database of the historic bridges in the Central United States. This includes everything from minor stone culverts to sweeping suspension bridges to massive steel truss spans. This also covers past, present, and future -- bridges that are long gone, those that are still standing, and those that might be built in the future using historic designs. The Historic American Engineering Record (HAER) was established in 1969 by the National Park Service, the American Society of Civil Engineers and the Library of Congress to document historic sites and structures related to engineering and industry. Many fixed and moveable bridges have been documented by the program and a complete list is available at the link above as part of Bridge hunter.com. 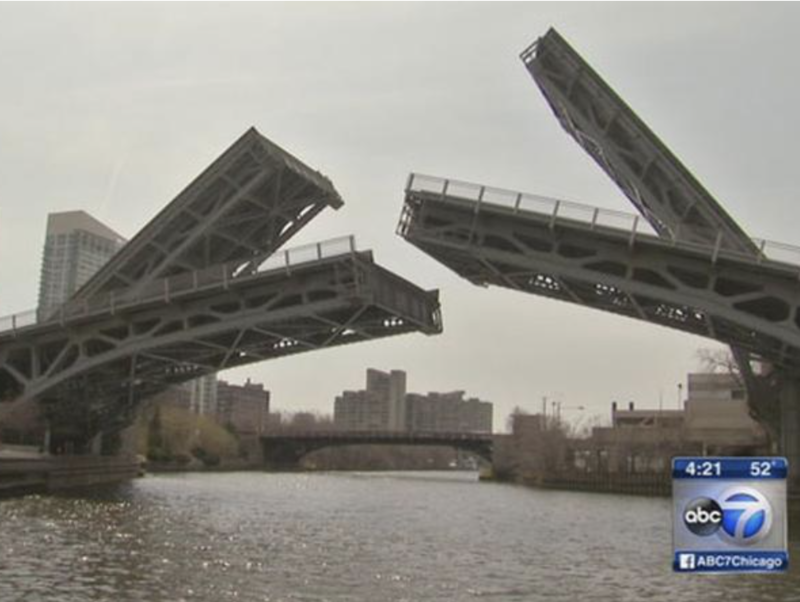 The website devoted to Chicago's downtown moveable bridges. 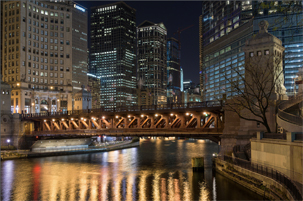 In 2006, Friends opened the seasonal McCormick Bridgehouse & Chicago River Museum in a landmarked bridgehouse on the Chicago Riverwalk to provide new access and understanding of the dynamic relationship between Chicago and its river. Click for opening hours and information. Is a labor of love by Dennis McClendon at Chicago CartoGraphics, and is part of a site called ChicagoinMaps.com. Listing of the bridges and viaducts of Chicago from the National Bridge Inventory data listing the year built and reconditioned, length, and sufficiency rating. Photography of Chicago's bridges by the grandson of Phillip G. Connell a contractor involved in the construction of many of today's bridges. Describes the project to light Chicago bridges in 2009. 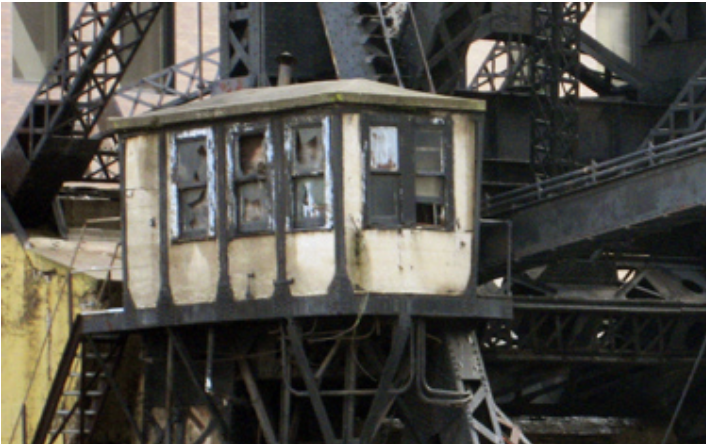 Provides a brief history on the evolution of the Chicago's bridges written in 2005. My question is about Chicago's drawbridges. How many are there? How many river bridges in total? Written in 2004. Conan on TBS during his week long visit to Chicago in June 2012. This leads to several more hilarious bridge jumps on YouTube. 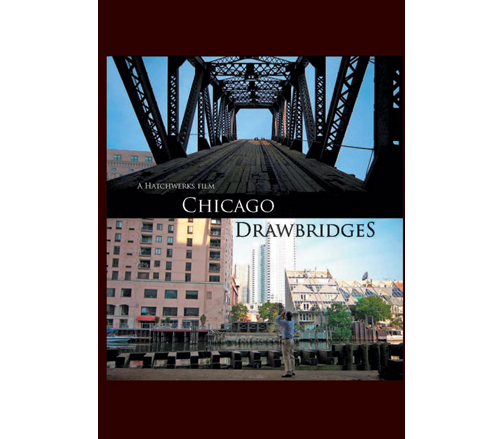 The film website about the documentary about Chicago's bridges that has aired on Chicago and Milwaukee Public Television. The 56-minute DVD is available for sale and 1:41 minute trailer may be viewed. 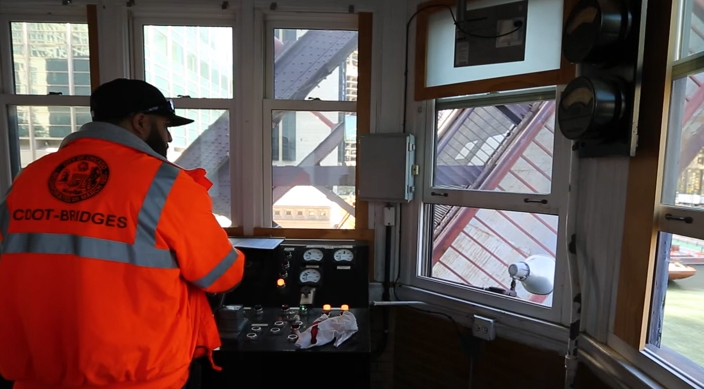 Shows a 2-minute video form 2014 on the Spring bridge run of boats going to the Chicago harbors. 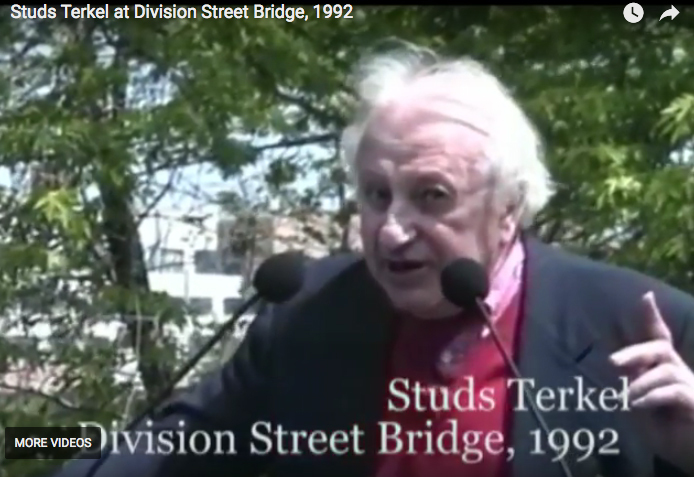 Independent video archive -- two short videos on raising the bridges of Chicago in 1993 and of Studs Terkel in 1992 from the dedication of an honorary brown sign in his name at the East Division Street Bridge. 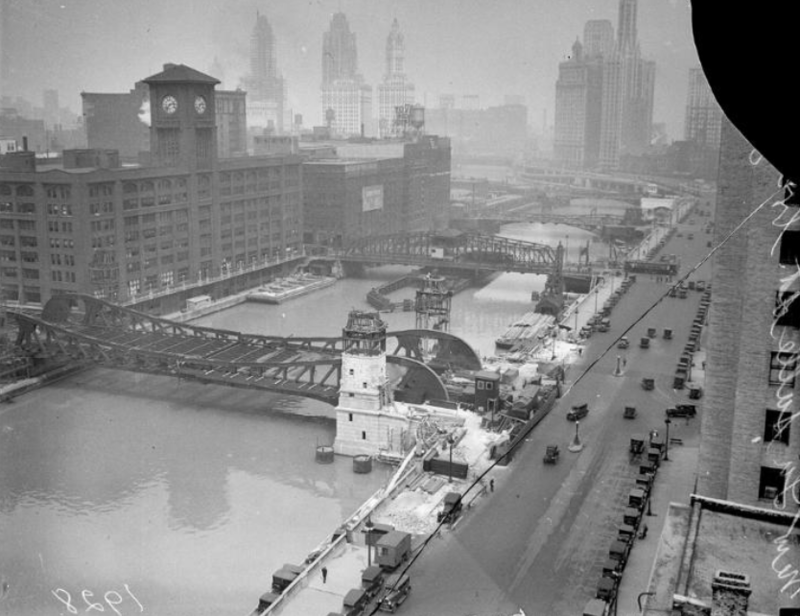 From 2010 showing this 1915 bridge lift for sailboats returning in the fall to boatyards on the South Branch of the Chicago River near Chinatown and an Amtrak train crossing the bridge once the bridge is closed. 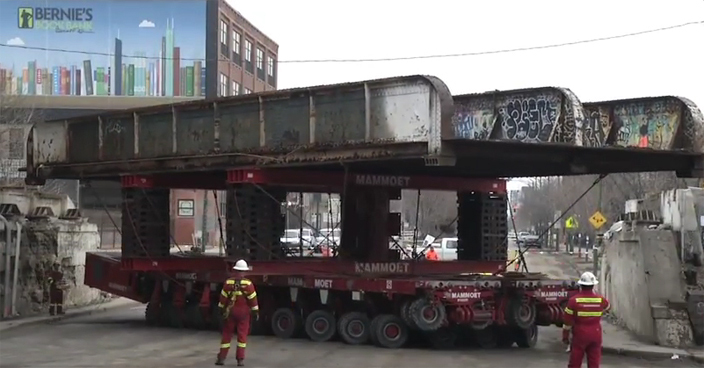 Time-lapse footage of moving the Ashland Avenue overpass bridge as part of the 606 Trail (Then named the Bloomingdale Trail) in April 2014. Cool shots of heavy equipment mover. 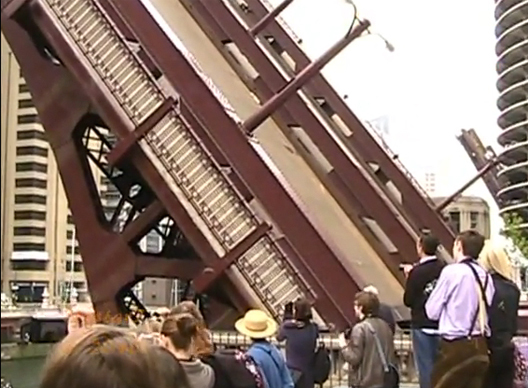 Atmospheric conditions were ideal on May 22nd, 2010, for Chicago's famous singing State Street Bridge. Avant garde found-music enthusiasts and fans of composer Phillip Glass from as far away as Germany were on hand to listen to the siren song of steel on steel. August 25, 2012 move of an overpass railroad bridge carrying trains over Torrence and 130th to create a grade separation. Some cool time-lapse and heavy equipment movers in action.